You can also follow your athletic passion beyond the ski slopes while on a winter holiday in Leogang. Cross-country skiing, winter hiking, tobogganing, ice skating and more: Find perfect sporting variety in the ski region of Leogang! 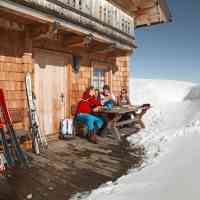 Tip: Experience numerous activities during your winter holidays for free with the Saalfelden Leogang Card! The new Saalfelden Leogang Card is now also valid in winter! Take advantage of great offers and all-inclusive services during your winter holiday. 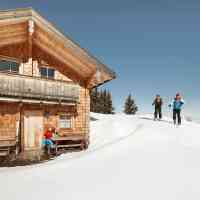 You can now use various winter sports programmes and cross-country ski runs in Saalfelden and Leogang as often as you like free of charge, sweat for free in the sauna or enjoy a free ascent and descent with the Asitz cable car. Discover more inclusive services in the Saalfelden Leogang Card Folder. Daily maintained slopes of every difficulty wow cross-country connoisseurs and athletic skaters who love the challenging world championship runs at the Ritzensee. 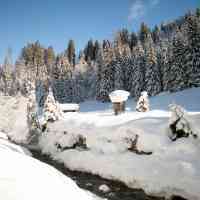 Numerous connecting runs lead you to Maria Alm, Maishofen and Hochfilzen; the ski bus is also free of charge for cross-country fans. Rent the latest equipment in the ski schools. 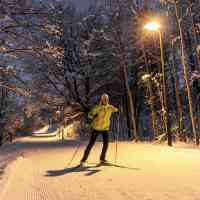 Top: the high-altitude run Griessen and the floodlit runs! NEW: With the new Saalfelden Leogang Card you can use the tracks for free! If you’d like to get away from the hustle and bustle of the Skicircus for a few hours, and are looking for peace and nature enjoyment, winter hiking is just the thing for you. Easy and medium round hiking trails lead you to cultivated mountain inns, the romantic pilgrimage village Maria Kirchental, or the wintery quiet lake shore. Tobogganing fun awaits at the end of many a winter hike: Borrow a toboggan in some ski huts and race down the valley! Leave groomed paths behind and hike through diverse terrain on modern snowshoes and hiking sticks borrowed directly from us in the hotel for free. Plan your snowshoeing tour with a guide: The experienced winter sport instructors know the best routes in Leogang & Saalfelden as well as potential dangers on the snow-covered mountains. Tip: Use the special offers of the winter experience programme from December to March! No matter which winter sport you and your kids like best, tobogganing will certainly bring you all together. Reach the starting points of the four toboggan runs in Leogang & Saalfelden by cable car, shuttle taxi or on foot – and race down on two skids! Tip: The natural toboggan run on the Biberg is the longest at 6 km, while on the Asitzbahn toboggan run – right outside Hotel Bacher – you can speed down the mountain under floodlights so quickly you’ll turn the snow to dust! Ice skating in divine winter scenery – you shouldn’t miss out on this experience on the frozen Ritzensee. If the weather doesn’t play along, you can skate your rounds in the indoor ice skating rink in Zell am See, illuminated in the evening. By the way, Curling is one of the most popular winter activities among locals: Be there, let your stone race across the polished ice and celebrate the result with a schnapps! For guided ski tours for beginners and advanced skiers, and special nature experiences, you can get all information at the ski schools. Experience the mountain nature without any effort on a horse-drawn carriage ride. 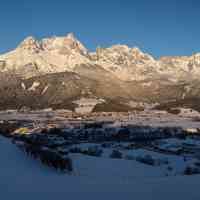 And when blue evening light enchants the winter scenery around Leogang, a torchlight hike is a particularly romantic holiday experience. Just take a look inside the Leogang Saalbach winter programme or ask around at the Hotel Bacher reception!